My office is very soothing. The furnishings are mostly from the 1870s to 1930s. There is healing music playing, maybe some candles burning. 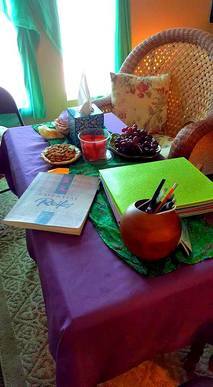 I have worked on the energy space so that it is like stepping out of time and into a safe, relaxing space. Each healing session begins with a conversation where you will share with me how your life, health, career, relationships are going and what you want support for from the session. As you speak, I intuit what may be going on energetically and I run logic on what practical guidance I can offer. I'm especially gifted at knowing how to make progress on your priorities and incorporate healthy/spiritual practices into your life - even if you are busy, ill, overwhelmed or depressed as hell. Once you've spoken what you needed to, and feel you've been heard and understood, I confirm our intentions for the session. Then you will move to the massage table, remaining fully-clothed, except for your shoes. Once on the table, I make a prayerful statement of intention. I may choose an essential oil or some crystals or use a singing bowl or chime if it seems necessary. Then I gently lay hands on the main energy centers of the body. I don't touch any of the more personal areas of the body. I channel energy in. Sometimes the session is silent. Other times, I may speak some affirmations, guide you through a meditation, guide you through some gentle breathwork as needed. You may relax to the point that you fall asleep. Or you may see color, get inspired ideas, have a vision, feel heat or cool or vibration. Sometimes, you will receive an answer to a question. Occasionally, some need to laugh or cry to release emotion. You may experience odd sensations arise from the site of an old surgery, injury or even an ancestral or karmic wound. If that happens I help you release it. Couples Healing is popular among couples but is effective for any people in relationship. I have done it with business partners, parents and children, grandparents and grandchildren. We make adjustments for appropriate levels of intimacy. This work is above all, an energy of love. I work from the heart, and I work to bring each person into their heart. The intention is to deepen the heart connection in folks who are already in a good place and for those struggling in their relationship to help them reconnect with the love they have for each other.​The session begins with a conversation where the couple tells me what they would like help with and what they love about their relationship. If need be I can help you with any difficulties in communicating this. 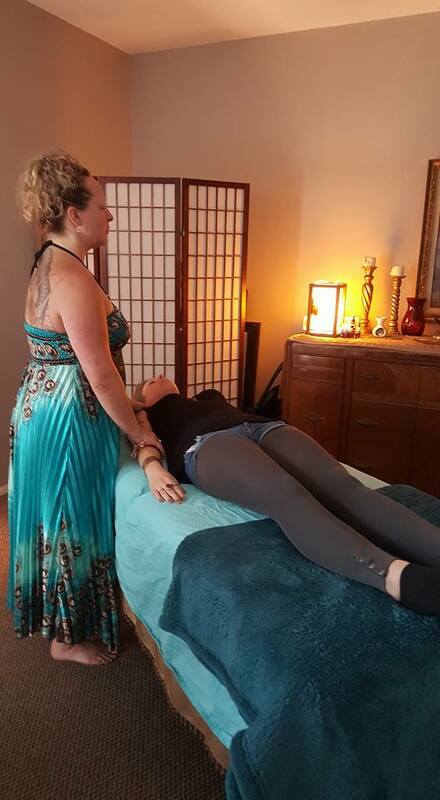 Then, one partner lays on the massage table, and their partner participates by channeling as much love as they can to the person on the table while gently touching their head or feet as I do the healing session encompassing both partners in the energy. Then you switch places. 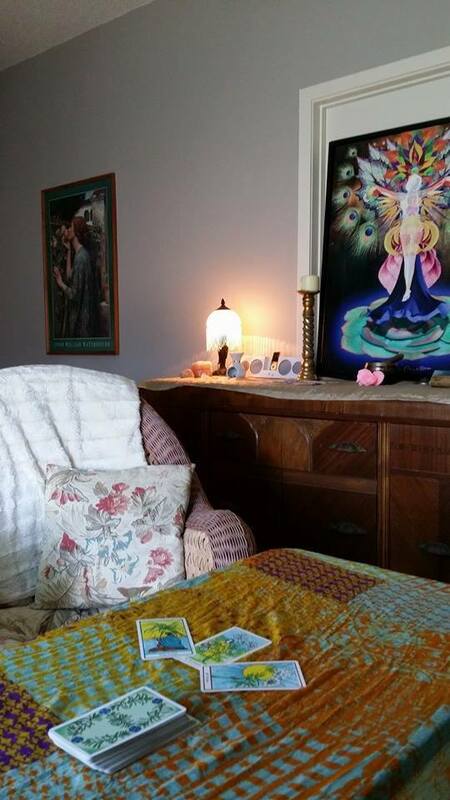 Once both partners have had their time on the table, you sit knee to knee and hold hands or put your arms around each other as I guide you through a meditation where I help you to connect and synchronize your chakras with one another. It is a beautiful thing! Many couples end up in tears and kind of overwhelmed by the feeling of love and connection. I recommend that couples take Reiki classes together so that they can do this at home. This is exactly the practice I use in my own relationship through illness, conflict, and difficulties. We practice until we feel the love in a tangible way again, and remember that we are on the same side. Then we can go back to the conflict as a team to solve the problem together. ​Before every reading I ask to be divinely guided such that I can combine my natural abilities and my knowledge of the cards in a way that serves the highest good of every person I work with. I will ask you to formulate specific questions around what is on your mind. And the cards will provide details about how things are likely to unfold. The intention around a reading is to tap into your worldly and inner resources. To steer your life in the direction of your joy and your dreams. While there may be some things that are beyond our control, so much of our life can be guided. This is a reading that will help you create your future. I can tell you the likely outcome of specific choices and offer guidance for where to put your efforts and attention in order to create your desired outcome. People often want to know, "Will we get back together?" I might nudge you toward the question of whether or not it is healthy for you to stay open to this relationship. If the answer is yes, then I will go deeper to get guidance for the best way to create a positive outcome. If the answer is no, then I can help find guidance for how to move forward and find your joy beyond the relationship.